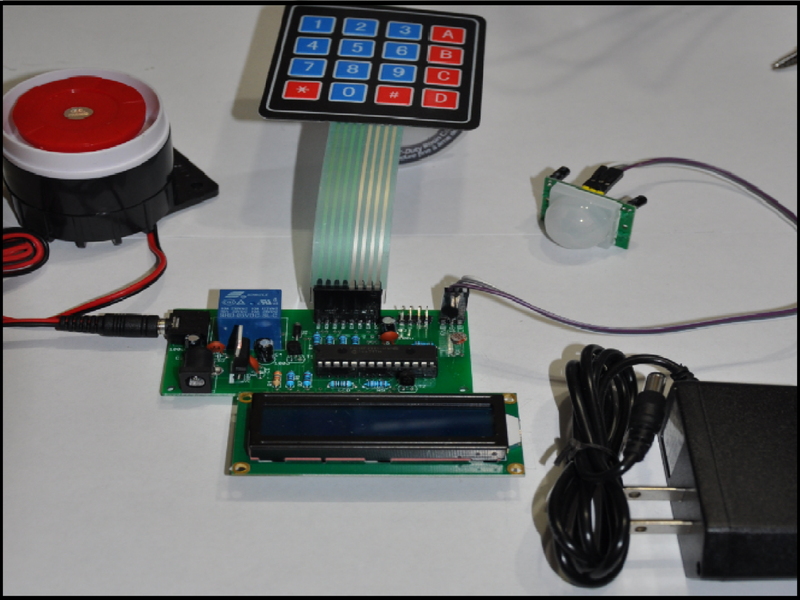 This listing is for a motion detector based electronic security alarm system project set. It comes fully assembled and tested. It is easy to use, and has several modes of functionality. The above video offers a full demonstration video. 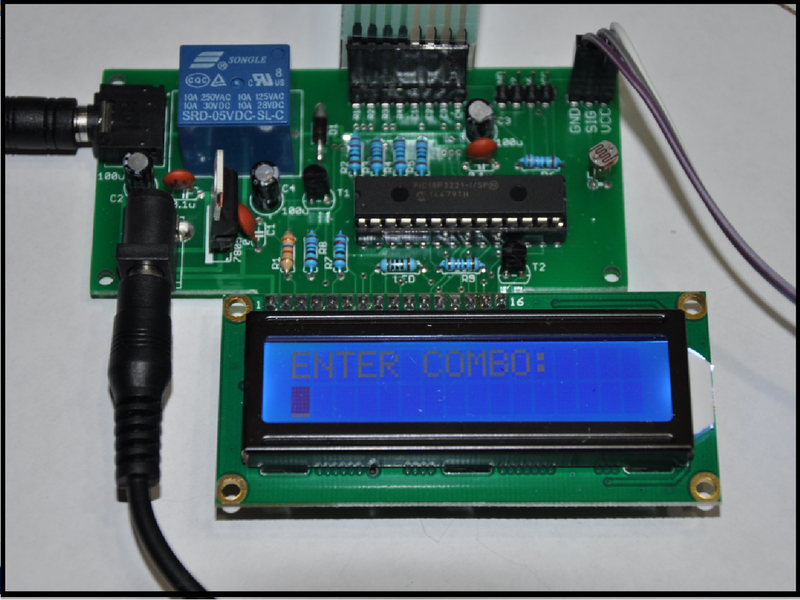 There are two programmable codes that can be custom programmed by you at any given point. These codes are saved into EEPROM memory, which means they are saved even after the unit is powered off. The two modes of operation are "Panic Alarm" mode, and "Motion Sensor Security Mode". These modes will be talked about below. This unit comes with lots of awesome hardware that all connects easily to the main processor board! When you first power this unit up, make sure that you are holding down the "1" button on the keypad. Make sure that you hold it down for at least three seconds. At this time, let go of the "1" button and you will be entered into "PIR CALIBRATION MODE". When you power up the unit, the PIR sensor output needs a short time to stabilize. After which, you can calibrate it. The LCD will tell you the state of the PIR sensor output. By tweaking the two variable resistors on the PIR sensor, you can adjust sensitivity. The PIR sensor will come to you already calibrated, but you can mess around with it if you'd like. You won't damage it. The goal here is to have the output normally low "L". When you walk or move near the sensor, the output should go from low to high "H", and then back to low "L" after ceasing movement or by moving out the way of the window of the sensor. A full demonstration of this can be found in the above video. If you have any questions, I'll be happy to answer. To exit from "PIR CALIBRATION MODE" simply press the "1" button again. If you are certain that the PIR sensor is calibrated, then we now have to program some custom 4-digit codes. The first code is the ARM/DISARM code. To enter in a few secret four digit ARM/DISARM code, enter in (Star / Number / 1 / 1) into the keypad when the LCD is prompting you to "ENTER COMBO:" Star means, star key (*), and number means, number sign (#). The unit will then display "ENTER PROGRAM MODE" for a short time, then "ENTER COMBO:". Now you can enter in a four digit code of your choice. This will be your ARM/DISARM code. Once you've programmed in your four digit code, the unit will tell you that you have successfully programmed your ARM/DISARM code into EEPROM memory. From here, the LCD will prompt you to again "ENTER COMBO:". When you are ready to arm your system, type in your newly programmed code, and the unit will start a countdown timer. When this happens, LEAVE THE AREA! When the unit completes the countdown, the LCD turns off, and the unit will lay dormant until the PIR sensor detects movement. When the sensor picks up movement, the CD will turn back on, and you will have five seconds to press the "!" key to disarm. If the timer elapses, the alarm will sound for a minimum of five seconds. The alarm is extremely loud! |The siren will stay on until you type in your ARM/DISARM code. Once you've entered this code into the keypad, the alarm will turn off, and the unit will reset. This mode is much simpler. Now we have to program in our second secret four-digit code into EEPROM memory. This code will be our "PANIC ALARM" code. When the LCD prompts you to "ENTER COMBO:", type (Star / Number / 2 / 2) into the keypad. The unit will then display "ENTER PROGRAM MODE" for a short time, then "ENTER COMBO:". Now you can enter in a four digit code of your choice. This will be your PANIC ALARM code. 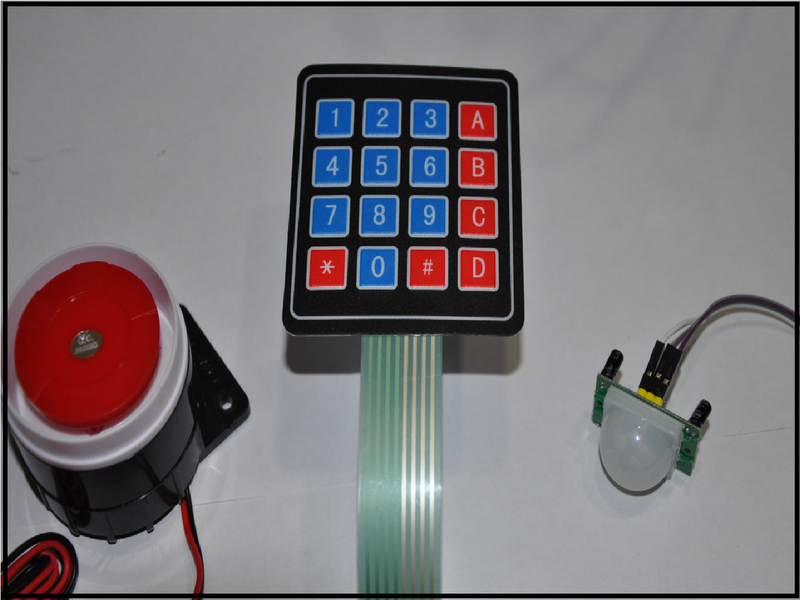 Once you've programmed in your four digit code, the unit will tell you that you have successfully programmed your PANIC ALARM code into EEPROM memory. From here, the LCD will prompt you to again "ENTER COMBO:". Now, every time you press this panic code, the siren will be activated, which will notify everyone nearby. This function is used for the sake of getting the attention of people. All of which comes to you connected together and tested as one working unit! Please note that this unit is not meant to take the place of a state of the art security system. It is a fun project that can be applied to non-serious applications. We also sell these in DIY kit form. Check out our other listings. We sell all sorts of awesome stuff! The siren and the main board have mounting holes for easy mounting. The Keypad would just need a thin layer of adhesive to mount to a flat surface. The PIR sensor does not have mounting holes, but if you have a large enough drill piece and a little bit of hot glue, then you can place the face of the white fresnel lens of the PIR sensor through a plastic project box, so that it is hidden.